KEWANEE – Marjorie A. Wickey, 76, of Kewanee, died at 2:08 a.m., Thursday, March 21, 2019 at OSF St. Francis Medical Center in Peoria. Funeral services will be held along with her husband at 11:00 a.m., Tuesday, March 26, 2019 at Rux Funeral Home in Kewanee. Pastor Kevin Drane will officiate. Visitation will be held from 5:00-7:00 p.m., Monday, March 25 at the funeral home. Burial will be at Evergreen Memorial Gardens in rural Kewanee. Memorials may be directed to the Marjorie Wickey Memorial Fund for a memorial to be established. She was born May 2, 1942 in Abingdon, the daughter of Harold and Lila (Button) Conway. 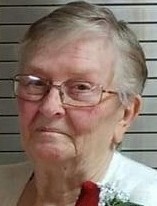 She married Terry L. Wickey on March 11, 1962 in Kewanee and he preceded her in death on March 15, 2019. Survivors include two sons, Daniel Wickey and his partner Todd Palmer of Los Angeles, CA and Walter Wickey and his significant other, Marcie Spiker of Kewanee, a daughter, Annette Finney of Kewanee, a sister, Peggy (Gary) Hadsall of Kewanee, a brother, Raymond (Sandra) Conway of Gilmer, TX, two grandchildren, Anna and Dakota, five special grandchildren; Kaylee, Jennifer, Caleb, Breanna and Tristan and six special great grandchildren. She was preceded in death by her parents. Marjorie graduated from Kewanee High School in 1961. She had worked as a sales clerk at Kresge’s and then later at Dollar General for 20 years, retiring in 2018. In earlier years, she also did modeling. She had served on the Hog Festival Committee, was a past Nobel Grand for the Rebekah Lodge, and had helped with United Way. In earlier years, she was a den mother and was involved with the Central School PTO. She spent many weekends assisting Terry with Pinewood Derby races. She enjoyed cake decorating, traveling, camping, sewing, going to yard sales and tending to the needs of countless individuals and making sure everyone got a hug. She also shared hand gestures to many she knew.